Just had this from Argos! For £5 you save 5% off your purchase when you select fast track... this is a great deal as you get 5% off every purchase... buy a Nintendo Switch and get an extra £13.50 off! Direct link, if this helps. Worth remembering this is invite only. 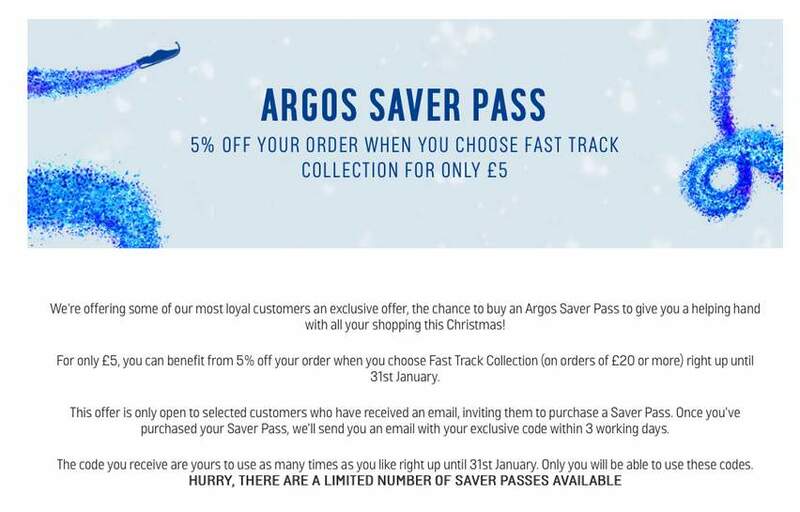 "We're offering some of our most loyal customers an exclusive offer, the chance to buy an Argos Saver Pass to give you a helping hand with all your shopping this Christmas! For only £5, you can benefit from 5% off your order when you choose Fast Track Collection (on orders of £20 or more) right up until 31st January. This offer is only open to selected customers who have received an email, inviting them to purchase a Saver Pass. Once you've purchased your Saver Pass, we'll send you an email with your exclusive code within 3 working days. The code you receive are yours to use as many times as you like right up until 31st January. Only you will be able to use these codes. HURRY, THERE ARE A LIMITED NUMBER OF SAVER PASSES AVAILABLE"
Can anyone help me? Any codes? Thank you. Can code I can use? I got the offer of a pass for £5 but no 5% off purchases, so no thanks! Email does also say only available to first 5000 folk who apply for it. "buy a Nintendo Switch and get an extra £13.50 off!" Makes it £266.59 saving £3.40 compared to Amazon. Good if you plan to make a lot of big purchases between now and end of Jan.
if you didn't get the email 792/2992 is the Catalogue Number. Yeah, if you know you're going to make a big purchase or multiple spends (north of £100 is enough) then it's a good deal. Personally I have no use for it, but if I was in the market for a TV or Console then it's a good bet. I get 8% through work using these reloadable (gift/store) cards. So potentially a saving of 13%! Hmmm... decisions. I got the email too. Since you are one of our most loyal customers, we have an exclusive offer to give you a helping hand with all your shopping! 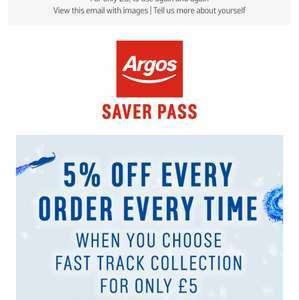 Simply purchase an Argos Saver Pass now and as well as unlimited free delivery (on orders of £20 or more) you'll also get 5% off Fast Track Collection (on orders of £20 or more) to use again and again, right up 'til 31 January 2018. Sssssh don't tell anyone though - this offer is only available to selected customers and won't work for everyone*. Direct link, if this helps. I would have bought a lot from Argos this year but their stock is terrible. Have offers on but no stock - Amazon price match and plenty of stock so end up buying from there. Retailers moan about Amazon taking over but if they actually had stock of what they put on offer I would happily buy from them. has anybody bought this despite not being emailed? Any issues? Good deal, no use to me though, 160 mile round trip to my nearest Argos, or any shopping centre for that. Heat added, great for those who can use it. I got offered buy a 6 month Sainsbury's delivery pass with £15 off I then get free argos delivery over £20 and the 5% code. I got offered buy a 6 month Sainsbury's delivery pass with £15 off I then …I got offered buy a 6 month Sainsbury's delivery pass with £15 off I then get free argos delivery over £20 and the 5% code. Can’t put all the blame on Perkbox, pretty HotUKDeals has had a hand (or hands) in your wallet! Good deal, no use to me though, 160 mile round trip to my nearest Argos, …Good deal, no use to me though, 160 mile round trip to my nearest Argos, or any shopping centre for that. Heat added, great for those who can use it. where do you live? Iceland! How? Where about u live? still a great deal though, have some heat! If they send you a 5% off code to use, what happens if there is a different promo code from a different offer (such as 20% off Furniture or 10% off TVs? )?Can you stack their codes? If they send you a 5% off code to use, what happens if there is a …If they send you a 5% off code to use, what happens if there is a different promo code from a different offer (such as 20% off Furniture or 10% off TVs? )?Can you stack their codes? I got a delivery pass for £5 but no 5% off. But 5% is hardly anything. I would have bought a lot from Argos this year but their stock is …I would have bought a lot from Argos this year but their stock is terrible. Have offers on but no stock - Amazon price match and plenty of stock so end up buying from there. Retailers moan about Amazon taking over but if they actually had stock of what they put on offer I would happily buy from them. Anybody ordered this? I bought the £10 one on Friday and still haven't received it. Don't think it was worth it now as the item I want will probably be out of stock by the time it arrives. If it's only a discount code why does it take so long to arrive? Anyone had any joy? I also signed up for this (on 4 Dec) and haven't received my 5% yet despite the t&cs saying it would be emailed within 3 days. Argos are telling me they know nothing about this offer and was supposed to get somebody to call me back yesterday but nothing so far. What a big con! Would be interested to know if anybody who signed up has got their code and I've just been unlucky or if everyone is in the same boat? I know it's only 5% off but this has to be some kind of Trading Standards issue - you can't just offer customers a discount code if they sign up for a delivery plan and then not supply the promised code. As I have had no joy with their awful customer services (how can none of them know about this email) I have gone through Resolver as I only signed up as I wanted to make a big purchase and the 5% would have come in handy so am not just going to ignore the fact they haven't followed through. Have never had an issue with Argos before but this has really put me off them as a company. I hope you get your callback Uungy but I wouldn't hold your breath as mine never came. Will you update if you do?